At Great Harvest, we talk a lot about building teams. In fact, it is easily one of the most important things that new bakery owners are tasked with before and after they open their doors. Building and managing a great team never stops, whether it is three days before the store opens or thirty years later. 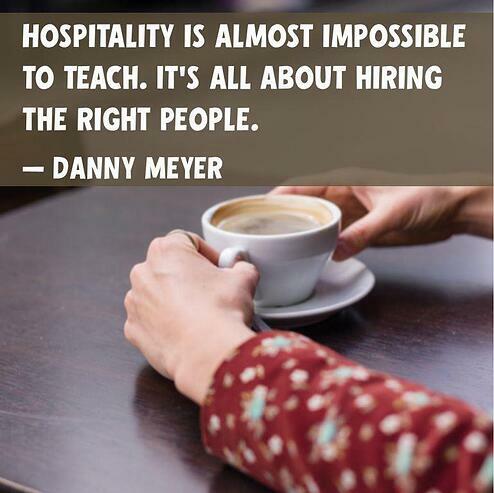 In the hospitality business, it is essential that we build, grow and cultivate the best teams possible. Whenever we ask our franchise owners what the hardest part of running their business is, the answer is almost always the people. Finding, training, keeping, motivating, and rewarding your staff is incredibly challenging. I've been thinking a lot about this lately as I have been reading famed restauranteur Danny Meyer’s book Setting the Table while out on the road visiting some of our most iconic bakeries. 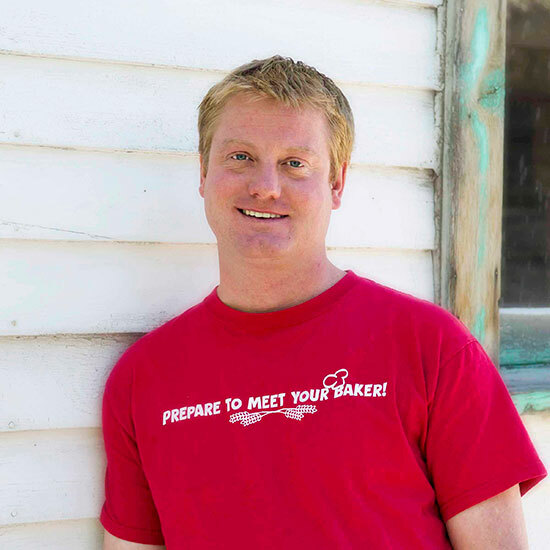 Whether or not you own one Great Harvest bakery or a string of incredibly successful restaurants, staffing them with people you want to spend the majority of your waking hours with is crucial. On my last trip, I was impressed by how many times I walked into a bakery and was introduced to an employee that had been there ten years, 16 years, and even 24 years. How do you manage a working relationship for so long so well? Being an effective manager is mostly about who you hire and how to get them to work together to be better than any one single person could be. When it comes to hiring, Danny Meyer hires with a view towards future roles, not just the current position. One of the points he makes is, why would you ever hire someone who you do not believe has the potential to manage others? I was particularly struck by Meyer’s description of hiring for what his longtime chef at Union Square Café Michael Romano calls "the Excellence Reflex." Capitalizing on each person’s zone of genius to compliment your own is incredibly important. Each day is filled with countless tasks that need to be completed, and our best owners know their own strengths and weaknesses. You don’t have to be great at everything, but you need to be absolutely brilliant in something. Recognize a team for what it is: an assemblage of power, like a great sports team. What makes a great punter doesn’t make a clutch running back but is still just as essential. Finding someone who can consistently show up at 3:30 AM — hours before anyone else — to begin baking is important, but it doesn’t mean that person is the right fit to help customers or work the cash register. Capitalizing on an employee’s strengths is just as important as not doubling up on weaknesses. 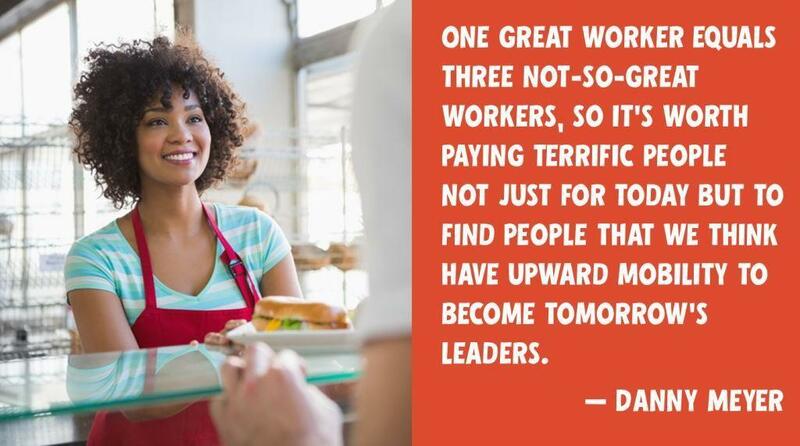 I also love Danny’s interpretation of what makes a great employee. He calls them “51 percenters.” 49% of their success is determined by their technical job performance and 51% is their emotional job performance – how well they interact with each other and customers. Basically, he feels that it is far easier to train someone to do any specific job task but nearly impossible to ever train personality. Optimistic Warmth (genuine kindness, thoughtfulness, and a sense that the glass is always at least half full). Intelligence (not just smarts but rather an insatiable curiosity to learn for the sake of learning). Work Ethic (a natural tendency to do something as well as it can possibly be done). Empathy (an awareness of, care for, and connection to how others feel and how your actions make others feel). Self-awareness and Integrity (an understanding of what makes you tick and a natural inclination to be accountable for doing the right thing with honesty and superb judgment). 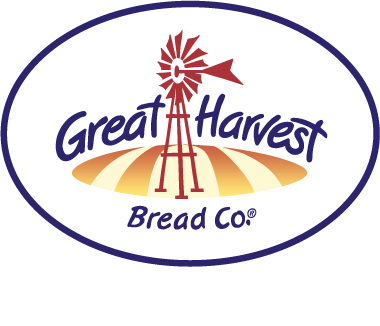 • What’s the Secret to Finding (& Keeping) Great Bakery Employees?